Nuclear magnetic resonance (NMR) imaging holds great potential for aiding ceramics processing development. NMR is a nondestructive method of analysis which has been in routine use in chemistry, physics, and biology for over 35 years. In these areas, its main applications are in determining chemical composition, molecular or crystal structure, and molecular dynamics.1,2 In 1973, the use of NMR in producing tomographic images of objects was reported.3 The development of NMR imaging (NMRI or MRI) for medical diagnosis is now proceeding at a furious pace.4 However, applications of NMR imaging in the materials sciences are only recently being explored. Our overall objective is to develop NMR methods for nondestructive evaluation in ceramics processing. The present report describes preliminary research directed toward the use of NMR for nondestructively mapping porosity and internal voids in green-state bodies. 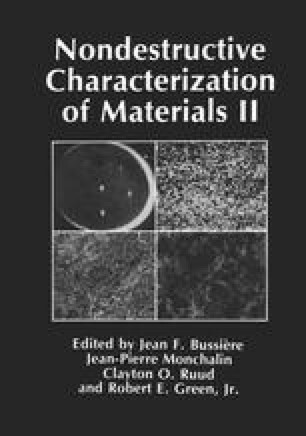 Some future extensions of this work include the imaging of pore size distribution, and the imaging of binders, plasticizers and other components of the test sample.